Deputy Attorney General Rod Rosenstein has done all he can to play fixer. But he failed. Rosenstein never expected to rise to the role. After all, James Comey performed so well covering for Democrats for so many years. But Hillary Clinton’s loss meant the Democrats would need to bring in their ultimate fixer, Robert Mueller. And that’s exactly what Rosenstein orchestrated. The problem is not even Mueller can fix this “Russian collusion” mess. Talk about an octopus gone rogue, as Leftists tentacle prints linger on too many fronts. So Rosenstein sees the writing on the wall. Deputy Attorney General Rod Rosenstein is expected to leave the Department of Justice (DOJ) within weeks, according to multiple reports. 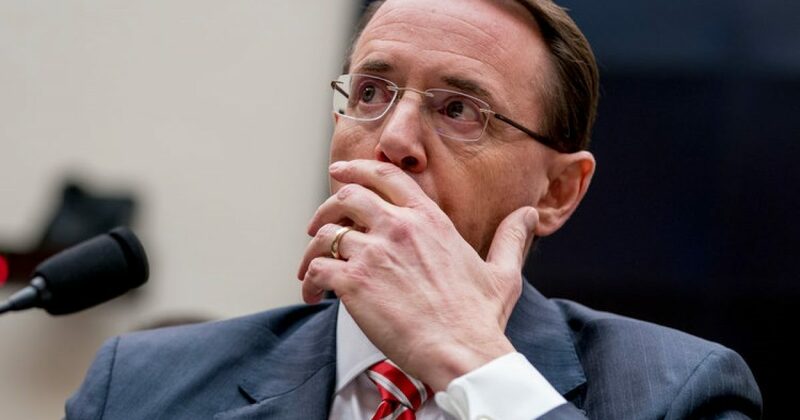 Rosenstein has told President Trump that he plans to leave following the confirmation of attorney general nominee William Barr, according to CNN and ABC News. Barr’s confirmation hearings in front of the Senate Judiciary Committee are slated for next week. Rosenstein’s departure would come after a rocky tenure as deputy attorney general. Understand that President Trump has methodically drained the swamp. And when you look at all the DC defections on his watch, it’s quite awe-inspiring. Well he didn’t resign or the president didn’t accept his resignation. If I were a Democrat, I’d ask myself why that didn’t happen. Given all the crooks the president uncovered within the DOJ, why would he leave Rosenstein in place? Then ask one more question: Why hasn’t Mueller released a report for an investigation that now goes into its third year? Rosenstein also oversaw special counsel Robert Mueller‘s investigation into Russian election interference in the 2016 election after Trump’s first attorney general, Jeff Sessions, recused himself from the probe. Trump has often lashed out at the DOJ over the investigation, calling it a “witch hunt” and accusing the department and the FBI of bias against him. Trump in November forced the resignation of Sessions and appointed acting Attorney General Matthew Whitaker, who is now overseeing the Mueller probe despite past public criticism of the investigation. If confirmed, Barr would take over for Whitaker in overseeing the investigation. With Rosenstein gone, the witch hunt goes. Because now Mueller finds himself on the defensive due to two lawsuits against him or his investigation. Without Rosenstein to provide cover, Mueller has been rendered useless. Incoming AG Barr rightfully has criticized Mueller’s handling of the Russian collusion farce, as has former Acting AG Whitaker. What of the two cases against Mueller? First, the Russians. Their lawsuit for defamation exposed that the Steele dossier was a lie. And more will be revealed. But the second case may be more harmful, as Mueller lost his ability to intimidate people. Author and Trump supporter Jerome Corsi is suing Robert Mueller for $350 million. Recently, Mueller asked a judge to delay the proceedings, citing the government shutdown. Unfortunately for Mueller, he didn’t make the case. Instead, the Judge ordered the lawsuit to continue. Corsi has an undeniably strong case against Mueller, who is accused of prosecutorial misconduct, leaking confidential information to the press, and last but not least, unconstitutional surveillance. “Absent an appropriation, Department of Justice attorneys are generally prohibited from working, even on a voluntary basis, except in very limited circumstances,” they claimed in the filing in Washington, D.C., District Court. So we will know more about that case soon. Finally, there is one other Rosenstein-connected conspirator against President Trump. Up to this point, the Clinton Foundation has never been audited by the Internal Revenue Service in its 20+ years of existence. When you consider the clouds of controversy surrounding one of the largest charity frauds in history, how have they escaped the scrutiny of the IRS. Click here for the “reveal”, and how the noose tightened around Rosenstein’s neck.